I’m getting back to my roots with this project, an unofficial “Gift Series” addition. My first true love will always be Cold Process Soapmaking despite my propensity to do melt and pour and all manner of other fun toiletries. For this unofficial Gift Series project, I created a soap recipe that will fit in our 5 pound wooden mold. Please be sure to follow all safety guidelines when handling Lye. If you haven’t studied a comprehensive guide on Cold Process soap making I highly recommend the Everything Soap Book.If you are new to cold process soapmaking, please purchase a book and read about the serious safety issues associated with lye. Another good book to start with is Susan Miller Cavitch’s “The SoapMakers Companion.”When working with lye, please always use gloves and goggles and do not breathe in the fumes. I also wear long sleeves during my soapmaking process and keep my goggles on the entire (entire, entire, entire!) time. Even I burn myself; if you missed the post last year where I dumped fresh soap on an open cut, click here to learn from my (idiotic) mistake. Scale (it doesn’t have to be digital but you do need to weigh all of your ingredients. I startedmaking soap with my Mom’s 1970’s Weight Watcher’s scale). Step 1 Weigh out all of your oils and make your lye solution (remember, always add the lye to the water). Stir the lye into the water taking precautions to not breathe in the fumes. Always use stainless steel or high temperature plastic for your stirring implement. Set the mixture to the side. You can put the lye water mixture outside if you are not in a well ventilated area. Make sure that small children and pets are not underfoot during this process. If you missed Konnor’s story about lye burns, click here to read it. Lye solution is caustic and can easily burn skin and damage eyes (you are wearing your eye proection, right?). Prepare your mold (this is a good time to line it if it requires lining). You want to have all of your tools ready and everything within reach. Step 2 Melt your oils and mix them all together. Add your lye solution and blend. Many soapmakers like to have their temperatures within 15 degrees of eachother for the lye water and the oil. If you’re a newbie, stick with a 105 to 115 range for your lye water and oils. I strongly recommend using a stick blender to help speed up the process. You’ll be blending for between two and five minutes before the next step. It will vary a bit based on your temperatures, blender and size of bowl. Step 3Once your mixture has reached a light trace (what’s trace? Trace looks like thin pudding where faint trailings of soap stay on the surface of your soap mixture when lightly drizzled from a few inches overhead. You can barely see trace trailings on the soap in the bowl on the left in the photo below), pour some of the soap mix into two other containers so you have 3 separate portions of soap. Add a teaspoon of green chrome to one and a teaspoon of the burgundy to another – you can add more if you want a darker color. Step 4 Mix in the color with your stick blender until all the clumps are gone and you’ve achieved the color you want. Next, quickly hand stir in your fragrance to each container. Mix again and get ready to pour! Tomorrow, I’ll cover swirling, the labels and cure time guidelines. Was there a mistake on this recipe? Should the coconut and olive oil be switched? That seems like an awful lot of coconut oil. Wouldn’t it be extremely drying? Wax Cat, I just rinse off the stick blender in between colors or even just wipe off the wet soap with a paper towel. That gets off most of it. Mim, The Coconut Oil and Palm Oil add to hardness and the Olive Oil also cures very hard. 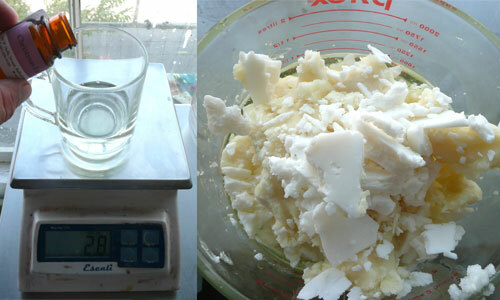 The Coconut and Palm Oil also add to the lathering ability of the soap. Jennie, I use .7 ounces of fragrance per pound of soap. That’s a good starter ratio. Joanna, It’s a mold we’re testing. We’re on the hunt for an HDPE mold that doesn’t leak. Lisa, The mold is a prototype that isn’t for sale unfortunately. =( Liquid Red and Green will not hold up in CP soap – the green morphs rather impressively into a strange gray pink if I remember right. I love the Susan Miller Cavitch book “The Soapmaker’s Companion” and “The Everything Soap Book” by Alicia Grosso. Very Nice. By the way don’t you love the HDPE molds. I couldn’t live with out mine. Do you use multiple stick blenders in this process, or do you just rinse in between colors? I don’t have a sink in my soaping area and always have a problem with this! I just received my Christmas Forest fragrance today. Guess what I will be soaping up now? I love the colors on your soap. The soap look BEAUTIFUL. I can’t wait to get out of work today and break out the soap pot! Thanks for the inspiration. Thanks for the cp tutorial!! Thanks Anne Marie I have been waiting for you to do a cold process tutorial. Please do more. Beautiful soap. 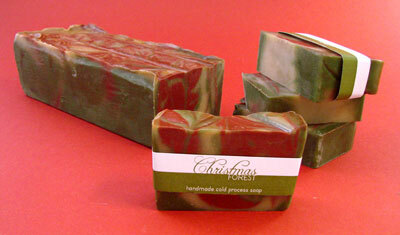 Reminds me of my holiday CP soap scented in your Holly Berry FO! Can’t wait to read Part II. That label is FANTASTIC and I must remember how you did it for future reference! How much fragrance did you use? I can never get mine to stick around. I guess I’m not adding enough. Wow – that is beautiful. I’m going to try to make this. Which mold did you use – can you link it to the Brambleberry site? Also, will food coloring liquids work also? Hey LAdy-Lou, where’dja get the hdpe mold? Are you going to sell them soon? Oh, this is great!! I am so excited! Is there an author you would reccommend for a first timer?